The RIAA was handed some bad news by a federal judge in New York: they can't sue people over songs that are merely "made available," which is the basis for nearly all of their lawsuits. Instead, they need to prove that songs were actually transmitted, something that is a hell of a lot harder to do. 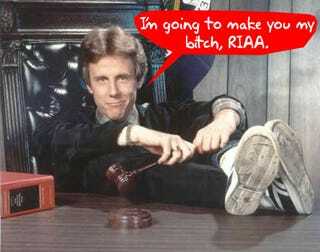 Is this the end of the RIAA's lawsuit onslaught? Cases such as the Jammie Thomas case, which resulted in $222,000 worth of penalties, are based on files being made available in a shared folder in a P2P program such as the now-dead Kazaa. In that case, there was no evidence that any transfers ever took place.